You'd think that Bono and The Edge, still finishing U2's new album, No Line On The Horizon, would have little time for outside projects. 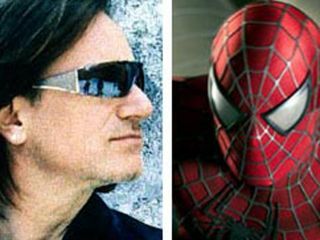 But the two are writing the score for the upcoming Broadway production of Spiderman: The Musical. Although the lavish production, said to feature state-of-the-art lighting and sets, isn't due to open till sometime next year, it's already making history of sorts. The show is being helmed by The Lion King's director Julie Taymor, no stranger to cost overruns and clashes with producers. A source says, "She doesn't care what it costs. Does not care at all. Her attitude is, it's for the art, and you don't question artists." Okay, then. Well, at least the music should be good.This isn't the first comic book collabo for U2: They contributed Hold Me, Thrill Me, Kiss Me, Kill Me to the Batman Forever soundtrack. In the meantime, U2 are still pounding away on No Line On The Horizon, which will cost considerably less than $40 million. And won't take nearly as long to break even.